One of the newest trends in highway line striping is to “groove-in” highly durable, wet reflective pavement markings. Over the past several years, material manufacturers within the pavement marking industry have began producing glass beads that are more reflective and have also developed “wet” reflective elements that maintain high levels of reflectivity, even in rainy weather when traditional pavement marking products are hardest to see. The pavement marking industry’s ultimate goal is to provide the driver with lines that are more visible in inclement weather when the pavement surface is wet. The new wet-reflective materials are much larger in size than standard reflective glass beads and are therefore much more susceptible to damage from traffic and snow plowing operations. In order to protect the wet reflective striping from plow damage, several states have started to require that the entire marking be recessed below the road surface. A groove slightly deeper than the thickness of the material is cut into the pavement surface. The wet-reflective pavement marking material, glass beads and reflective elements are then applied directly into the groove. Wet reflective pavement marking materials include epoxy resin traffic paint with reflective elements, poly-urea with reflective elements, all-weather thermoplastic and preformed retroreflective pavement marking tape. 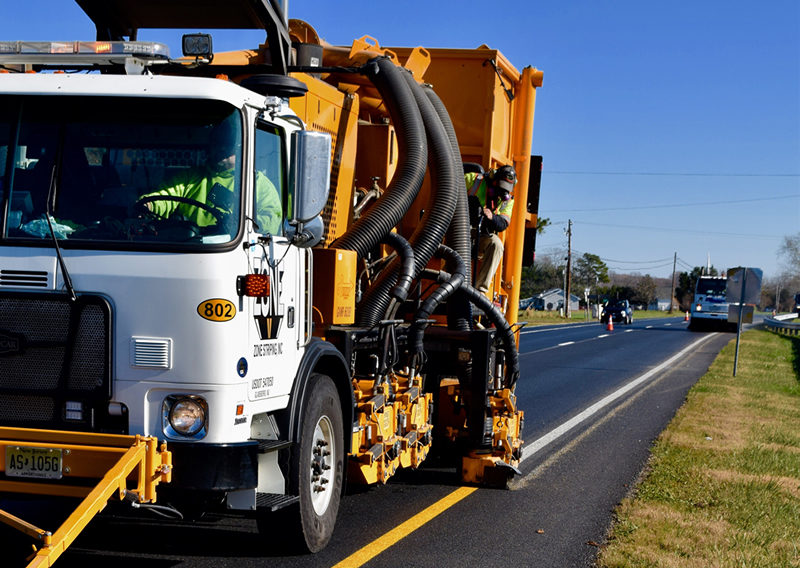 Zone Striping, Inc. has the equipment and experienced workforce to install all of the wet-reflective materials currently available for roadway striping. Zone Striping, Inc. has successfully completed grooved pavement marking installation projects for the Pennsylvania Turnpike Commission, Pennsylvania DOT, Maryland Transportation Authority and Maryland State Highway Administration.